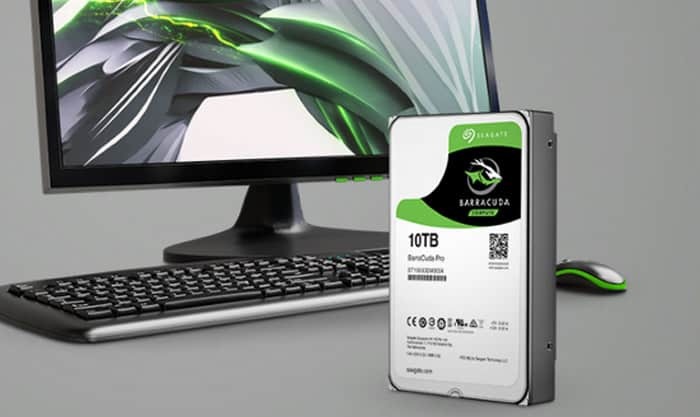 Since hard drives are still a thing, Seagate has announced the release of a massive 10TB one for home PC users. Dubbed BarraCuda Pro, the 3.5-inch disk spins at 7200 RPM, flaunts the SATA 6Gb/s interface and features 7 platters along with 14 heads. Of course, one of the most attractive things about the HDD is that it’s covered by a 5-year warranty. It should do fairly well when stacked against competitors, thanks to the generous 256MB of cache Seagate has poured into it. If the 7-platter construction of the BarraCuda Pro bothers you, the company wants you to know that the disk consumes as little power as possible. It is claimed to use merely 4.5 watts of energy when it’s idle, and 6.8 watts of electricity during seek operations. You can read about its sustained transfer rate of 220MBps and other minute specifications by heading over to the data sheet provided on Seagate’s official site. As for the price, it’ll cut a painful $534.99 gash in your wallet. Alternately, you could buy the less impressive new BarraCuda in 2TB or 3TB capacities for $80.99 or $99.99, correspondingly. Apart from the mainstream consumer-targeted BarraCuda HDDs, Seagate also launched two other options. The SkyHawk is built for surveillance applications, while the IronWolf is suited for for NAS purposes. Both are offered in 10TB capacities and have 2-year warranties on them. The former is pegged at $469.99, and the latter can be bought for $459.99. So why would you need so much local hoarding space with blazing fast internet speeds and easily accessible cloud storage? Well, Google did blast 14 years of artist Dennis Cooper’s work as well as his email ID into oblivion without much warning. Who’s to say something similar can’t happen to your cloud account? Next articleAre Drones The Future Of The Pest Control Industry?